Posted in Campus Affairs, Israel, Middle East. 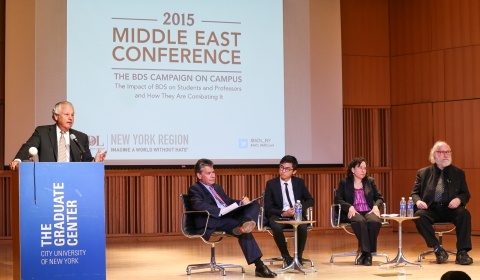 Last night ADL New York Region held its 8th annual Middle East Conference at the Graduate Center of the City University of New York. This year’s conference, co-sponsored by the Benjamin N. Cardozo Jewish Law Student’s Association and New York University Law Students for Israel, addressed the Boycott, Divestment, and Sanctions (BDS) movement and its harmful impact on college campuses across the United States. This topic was chosen to confront rising anti-Israel attitudes on universities as the climate of violence in Israel and the Middle East intensifies. From left to right: Gregg Mashberg, ADL New York Chair Emeritus; Anthony Berteaux, journalism student at San Diego State University; Rabbi Julie Roth, Executive Director of the Center for Jewish Life – Hillel at Princeton University and Cary Nelson, Professor of English at the University of Illinois at Urbana-Champaign. Combating It” featured an engaging panel which included Anthony Berteaux, a journalism student at San Diego State University; Cary Nelson, Professor of English at the University of Illinois at Urbana-Champaign; and Rabbi Julie Roth, Executive Director of the Center for Jewish Life – Hillel at Princeton University. 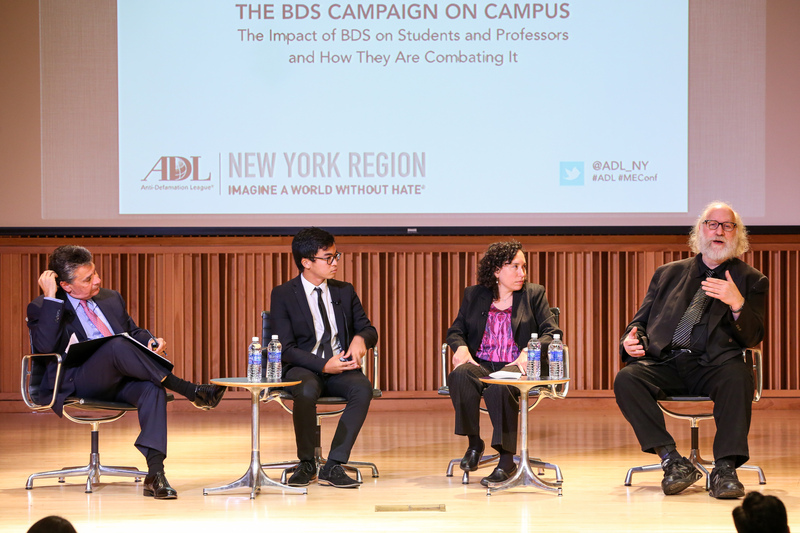 Gregg Mashberg, ADL New York Chair Emeritus and Partner at Proskauer Rose LLP moderated the discussion centered on the challenges BDS activity presents students, professors, and Jewish professionals on campus. The panel shared their personal experiences with the BDS movement on their respective campuses, and expressed the necessity for pro-Israel voices on campus to speak up and be heard. We want to thank Jeffrey and Shelley Parker, members of ADL’s National Executive Committee of the National Commission and past Chairs of ADL’s New York Regional Board for generously funding such a successful and important event.